A new group of community wardens will be tackling issues from anti-social behaviour and road safety to littering and dog fouling across the borough. Calderdale Council has increased the number of its wardens to provide a more visible presence. This will build on the service already provided by the Council’s eight existing neighbourhood-based community wardens. Councillor Susan Press, the Council’s Cabinet Member for Neighbourhoods and Communities, said: “Community wardens provide a valuable contribution to communities around Calderdale and we know that residents feel reassured by their presence. 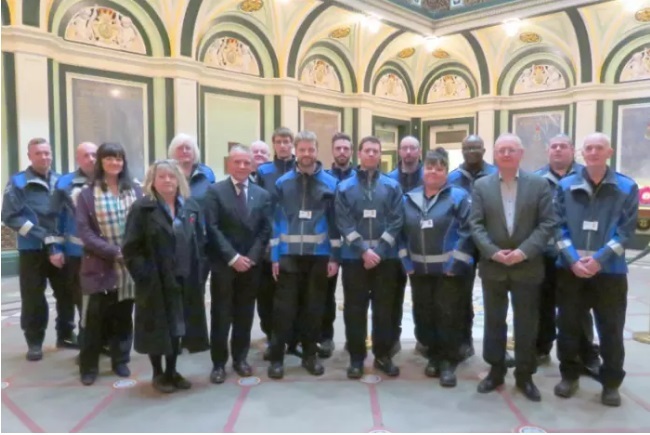 “I’m delighted that we’ve recruited another 15 new wardens to contribute to the great work that our existing wardens have been providing across Calderdale.” The new recruits have been in training since the start of October, working closely with Council services and partners such as the fire service and trading standards. West Yorkshire Police has also provided a vast amount of training to help the wardens understand partnership working. Police Chief Inspector Gareth Crossley said: “Community Wardens are a fantastic asset to the communities of Calderdale and further extend and complement the partnership working already in place across the district. “Community Wardens enhance the high visibility presence we have already across Calderdale and their support in tackling civil issues will allow our teams to focus on appropriate enforcement where justified.